The WHL in Nanaimo, home of the BCHL’s Clippers? Of course, the WHL would love to have a franchise in Nanaimo, something that would allow teams from the mainland to visit Vancouver Island and play games against more than one team. However, there simply isn't an arena on the island, other than the one that is home to the Victoria Royals, that meets the league’s standards. Furthermore, the City of Nanaimo has flat-out refused to get involved in the construction process. I have been told by someone who is involved with a group that apparently kicked the tires on the Kootenay Ice that there “never” will be an arena in Nanaimo that would be capable of housing a WHL team. Of course, the WHL used to be in Chilliwack — you may remember the Bruins and the messy situation that led to them becoming the Royals. Has enough water gone under the bridge that the good hockey fans of Chilliwack would forgive and forget? What you really have to wonder, though, is: Why would anyone be interested in getting involved in the ownership of a WHL franchise at this point in time? After all, the CHL, its three leagues (OHL, QMJHL and WHL) and 60 teams are all but pleading poverty as a proposed class-action lawsuit that asks that players — and, retroactively, former players — be paid minimum wage makes its way through the courts. This has gotten some headlines in B.C. of late after the Vancouver Sun reported that the governing Liberals made a quiet move in February to exempt the province’s six WHL teams from minimum-wage laws. “Recent reports have grossly overstated WHL club revenues and franchise values,” Robison wrote in a statement that appeared in some newspapers this week. “The majority of WHL Clubs either break even or lose money on an annual basis and we commend our WHL Clubs for their commitment to preserving the benefits provided to our players despite the challenges they face. Any change to the status of our players as amateur athletes would result in our clubs having to adjust the benefits currently offered to players. B.C. joined Nova Scotia, Saskatchewan and Washington state in exempting WHL teams from minimum-wage legislation. All four jurisdictions did it without requesting that WHL teams open their books. The province of Quebec, home to 13 CHL teams, is said to be next in line. A couple of WHLers who lost out in the 20-year-old game have joined BCHL teams. . . . F Duncan Campbell, who was waived by his hometown Brandon Wheat Kings, now is with the Penticton Vees, while G Trevor Martin, who was dropped by the Red Deer Rebels, has joined the defending-champion West Kelowna Warriors. . . . Campbell was pointless in six games with Brandon this season, after putting up 10 goals and 12 assists in 72 games last season. . . . Martin, from Saskatoon, was 18-8-2, 2.63, .911 in 38 games with the Rebels last season. This season, he got into three games, going 0-1-1, 4.14, .888. The Kootenay Ice has dropped G Declan Hobbs from its roster. Hobbs, 18, is from Saskatoon and was a third-round pick by the Ice in the 2013 WHL bantam draft. This season, he was 0-3-0, 7.16, .800 in 142 minutes over three appearances. Last season, in 24 appearances, he was 2-14-3, 4.66, .873. He is the younger brother of Regina Pats D Connor Hobbs. . . . The move leaves the Ice with two goaltenders — veteran Payton Lee, 20, who is playing his final junior season in his hometown, and freshman Jakob Walter, 17, from Langley, B.C. He was a second-round selection in the 2014 bantam draft. The TV show Gunsmoke had a long run that ended in 1975. Of course, it’s still available in reruns and, as it turns out, it has more than a few viewers. How many? “More than four decades later,” writes Neil Best of Newsday, “the fabled western drama has not lost its swagger, regularly winning ratings shootouts with much of what modern media has to offer in reruns at 3 p.m. on TV Land.” . . . Best’s complete story is right here and, yes, it’s most interesting. I guarantee that you will be shocked to find out how many people still tune in Gunsmoke. F Glenn Gawdin, 19, was named captain of the Swift Current Broncos on Thursday. Gawdin, from Richmond, B.C., is in his fourth season with the Broncos. . . .
F Mathew Barzal didn’t play for the New York Islanders on Thursday in a 4-2 loss to the host Pittsburgh Penguins. Barzal, 19, is pointless while playing in two of the Islanders’ first eight games. He is eligible to be returned to the Seattle Thunderbirds, a move some observers feel is imminent. 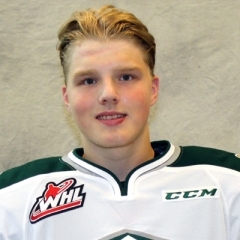 At Everett, F Eetu Tuulola scored twice to help Silvertips to a 4-2 victory over the Tri-City Americans. . . .
Tuulola, a Finnish freshman in his second game since suffering a shoulder injury on Oct. 2, has three goals. He broke a 1-1 tie at 7:21 of the second period and upped the lead to 4-1 at 3:46 of the third. . . . F Spencer Garth had given Everett a 1-0 lead, with his first goal, at 2:32 of the opening period. . . . Tri-City F Morgan Geekie’s fifth goal tied it at 10:53. . . . F Riley Sutter’s seventh goal put the home side in front 3-1 at 15:01 of the second period. . . . Tri-City F Nolan Yaremko added a PP goal, his second goal this season, at 15:06 of the third. . . . F Kyle Olson had two assists for the Americans. . . . G Carter Hart blocked 21 shots to earn the victory over Beck Warm, who made 24 saves. . . . The Americans were 1-3 on the PP; the Silvertips were 0-1. . . . Everett (10-2-2) has points in three straight (2-0-1). . . . The Americans (8-6-1) had been 2-0-1 in their previous three games. They wrapped up a stretch of six straight road games (3-2-1). . . . F Sasha Mutala, the sixth-overall pick in the 2016 bantam draft, made his debut with the Americans. From Vancouver, he plays for the major midget Greater Vancouver Canadians. . . . Announced attendance: 2,988. Brandon vs. Kootenay, at Cranbrook, B.C. Prince George at Lethbridge, 7 p.m.
Spokane at Prince Albert, 7 p.m.
Seattle at Swift Current, 7 p.m.